Why is any of this important? 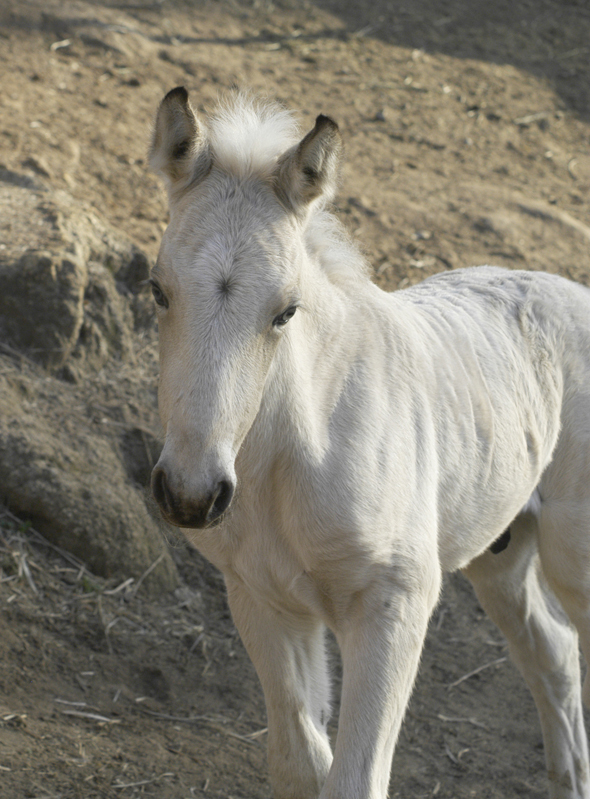 Because Malachi, from his first moment on the planet, was living the life every horse on the planet should be living. He was big, and strong, and healthy, and almost single-handedly changed Dr. Matt’s mind about all the crazy non-traditional things we were doing. Like no stalls, no shoes, no sugar. When a horse is forced to live in a manner that directly opposes the way he was genetically designed to live, the stress alone can wreak all sorts of havoc with his physical and emotional being. So how is he genetically designed to live? 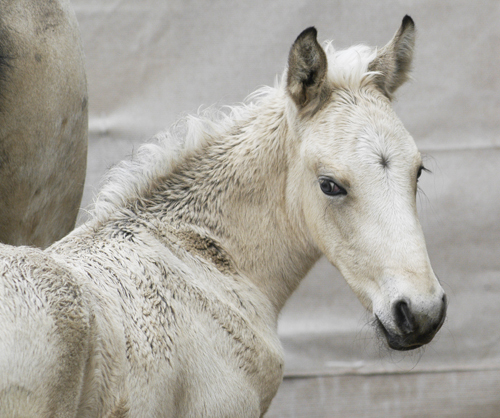 Every horse on the planet is designed to live like a wild horse. That was exactly my first reaction. But it’s true. 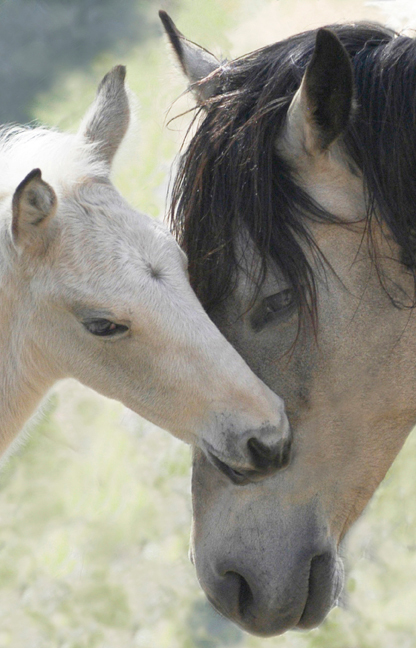 Science tells us that domestic horses and wild horses are genetically precisely the same. The horses in our back yard are really wild horses in captivity. Just like a baby tiger would be, even though his mom, grand mom, and triple-great grand mom were all born in captivity. That baby’s genetics are still the same as those beasts roaming the African jungles. The scientific fact, we discovered, is that it takes between 5000 and 10,000 years to even begin to change the base genetics of any species. Obviously not me and Kathleen when we acquired our first horses, nor the experienced experts who were advising us with phrases like: This is the way it’s always been done! Our guys and girls all lived in a manner diametrically opposed to what their genetics were calling for. They lived in tiny little stalls where they could move at best 800 steps in a 24-hour day as opposed to the 8-20 miles a day their genetics called for. And we ultimately discovered that such a huge differential was not just affecting physical structure, it was affecting their digestion, their breathing, the health of their feet, their immune systems, and thereby immensely affecting their stress levels which, as medical science has finally come to realize, substantially affects all aspects of their health. Their diet was mostly sugar in a bag, which we discovered is the absolute worst thing one can feed a horse, especially a confined one. Molasses is part of virtually every packaged feed in existence. Every grain in the same bag turns to sugar the instant it gets inside the horse. And, as mentioned above, horses are genetically programmed to eat grass forage (real grass or grass hay), little bits at a time, up to 18-20 hours a day. The horse’s hind gut is programmed to release digestive acid around the clock. 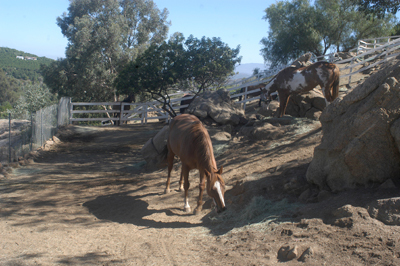 Acid that digests grass (not sugar, not alfalfa, not pellets, not carrots, just grass or grass hay). When that grass forage is not dribbling into the hind gut on a regular basis the acid has nothing to work on but the insides of the horse itself! Unlike humans whose digestive acid turns on and off depending upon whether food is present, the horse’s digestive acid never stops. So the grass forage needs to be there. Free-choice. Around the clock. Remove all of that stress, whether human or equine, and you remove the cause of many if not most medical and emotional issues. 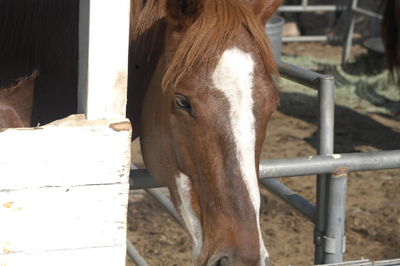 For horses, just the stress of being cooped up in a stall can cause or lead to ulcers, colic, laminitis, reduced blood circulation, digestive issues, lowered immune system, and, of course, each and every stall vice in existence. Add packaged feed filled with grain and/or sugar served up two or three times a day instead of grass or grass hay around the clock and you increase the incidence of all of the above and all sorts of other issues. Toss in the lack of movement the horse is designed to have and add metal shoes nailed to his feet that eliminate the ability for the feet to flex which circulates the blood in the hoof capsules and up and down the legs, and all the bad stuff quickly compounds. On and on it goes. Building the horse’s immune system is the singular very best thing you can do for a horse’s health and happiness. And building the immune system begins with eliminating stress. Then getting the diet, movement, feet, and blood circulation as close as your specific circumstances allow to the lifestyle the horse would be living were he or she in the wilds of the American west where he or she evolved. I know, I know. So many have told me “I have no choice but to board my horses.” Or “I simply don’t have any room for them to be out.” And all I can say is do the very best for your horse that your circumstances allow. Two makeshift Paddock Paradises each barely bigger than the footprint of a barn. 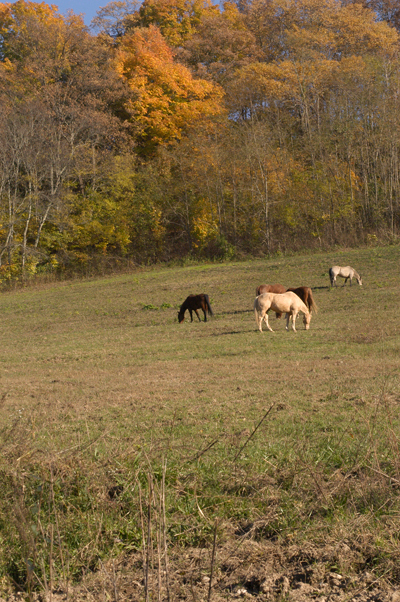 Each housing three horses. Not a lot of room, but at least they were out of the stalls. And they were eating grass hay around the clock spread in small piles all around the perimeter fencing and criss-crossing through the middle to stimulate movement. The dominant horse would never let #2 eat very long on a pile. So #2 would move out #3 who would go on to pile #4… and so it would go pretty much all day and night, moving around and around the paddock, except for nap times. 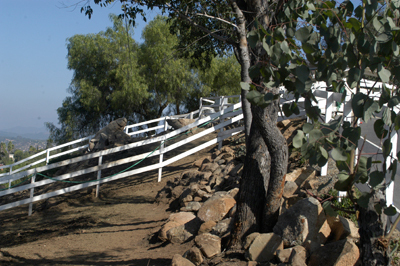 Later, this became Noelle’s and Malachi’s paddock. Frankly we were extremely nervous about letting the herd out into these two paddocks, scared to death that the steep hills and the rocks and boulders might cause injury… without a clue at the time that this is exactly the type of terrain that horses evolved on for millions of years out in the Great basin and Plains of the western USA. It didn’t take long however to see that they were thriving. Happier and Healthier. We fed morning and evening. A few supplements top dressed on Triple Crown Safe Starch, a packaged forage of orchard and timothy grasses guaranteed to be less than 10% NSC (non-structured carbs which turn to sugar immediately upon entering the body), and we assured free choice grass hay around the clock by putting out morning and night, a bit more when we found it all gone, and a little less when we found some left over. Their half-covered stalls were at the top of the hill just above the above photo. 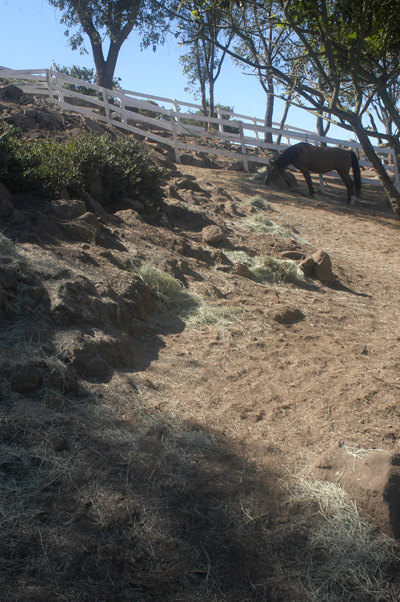 Whenever a storm would blow in from the Pacific we’d move them to the stalls until the hillside dried enough to eliminate any danger of slipping. They were doing so well that we soon began to eye the very steep hill behind our house. So steep it was basically worthless except as a buffer against another house getting too close. It could not be built on and basically was serving no purpose. The entire piece was a bit over two acres, but about half an acre of that was so dangerous looking we reduced our working area to approximately an acre and a half and installed an electric fence outside perimeter and another one as an inside circle that created, again, sort of a makeshift paddock paradise, only bigger than what we had originally created. In the photo below the yellow dots are the outside circle and the blue dots are the inside circle into which they were never allowed. A no-fly zone :). The very first time we took a horse over to see how he did, we were worried. Was it too steep? Would the horses like it? 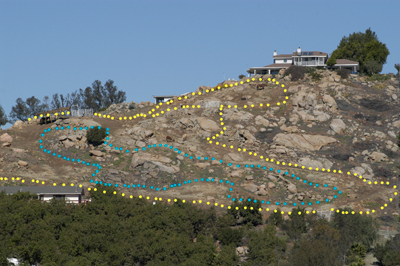 Were there too many rocks and boulders? Would they hurt themselves? Would they all get along in the same pasture? He’s the quiet one. A gorgeous paint, but charisma is not his long suit. He’s the one who was most likely to be found standing in a corner, motionless, seemingly, for hours. Lazy would be a merciful understatement. He has the best whoa in the herd, because it’s his favorite speed. No reins needed. Just sit back a little, then hold on for the screech of tires. Can we stop now? is his favorite question. He leads like it’s an imposition to ask him to move. Oh all right, if you insist, but you have no idea how much effort this is. Which is why his first venture into the natural pasture left me with my mouth hanging open in astonishment. As the halter fell away, he spun and was gone like a bullet. Racing, kicking the air, tossing his head, having the best time I’d ever seen him have. This was not a horse I had met before. He went on for a good ten minutes, with me just standing there, grinning like an idiot. I could imagine that somewhere inside those two brains he was screeching Whoopee! I’m free! I’m free! Finally, he trotted back over and in his own begrudging little way said thank-you. 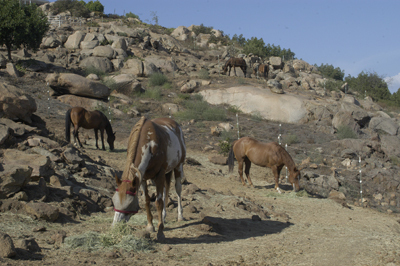 That was the beginning of a new way of life for Scribbles and his five herd mates. A life free of stress from being confined. From eating stuff that’s bad for them. A life of movement, and circulation, and good digestion. In short, a life as close as we could get to how they’d be living were they in the wild. On barely more than an acre. Sad eyes. Locked up. No movement. Lots of stress. It’s not that way anymore. It wasn’t in California. And it’s not here in middle Tennessee. Kathleen and I strongly encourage you to not take our word for it. Do the research. Figure it out for yourself. And see the difference that stress-free horses will add to your life. You won’t be sorry you did. On the evening of June 3rd, 2009, exactly three months from the day of Malachi’s birth, we lost him in the aftermath of a violent thunder and lightning storm that knocked out a power pole on our property. As we piece together what happened (we were out of town), a fleet of huge power company trucks climbed our driveway that night which passes right by Noelle and Malachi’s paddocks and stalls. These gigantic loud monsters apparently freaked Malachi into a frenzy and he ran head first into a post and snapped his brain stem. According to Dr. Matt he dropped immediately and died on the spot. Noelle stood by him until his body was taken away, then she went to the spot where he was born and would just stand for hours at a time. She was as devastated as we were. Just devastated. He was our first and only baby. We only wanted one. And so much of the rest of my life was wrapped up in him. I so looked forward to going down at feeding times because Malachi got to come outside and play at liberty while I loaded the gator for the pasture feed. He was such a good boy. Everything you could ask for in a messenger for the mustangs, bearing the message of change as his Biblical counterpart had done. Change for mustangs, for all horses; and he represented everything we had learned in The Soul of a Horse, our entire journey. His birth was to be the first chapter of the next book. I loved him so, and so looked forward to the rest of my life with my boy horse. It was all so random. So wrong. Tears are still streaming down my cheeks nine years later. Read the National Best Seller that started it all. Now in its 15th Printing.